So many visitors crowded to our stand last year, experiencing the energy of colour and life in the open air. The multi-sensory atmosphere that stimulates visitors’ sight, smell and hearing is about to return, with all new features at the Salone del Mobile in Milan, in the area dedicated to XLUX luxury: HALL 1 STAND H15. 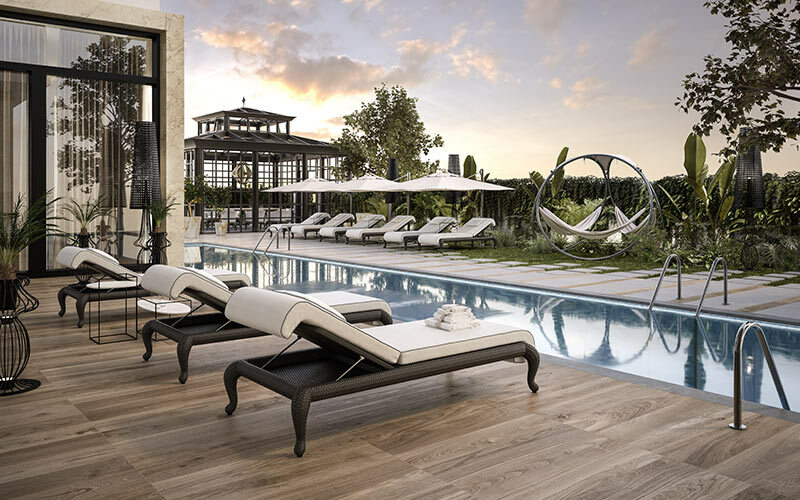 This year too, DFN will be a protagonist of the outdoor luxury sector thanks to its furniture collections and new offer of conservatories that can enhance the outdoor areas of the house in a totally new way. 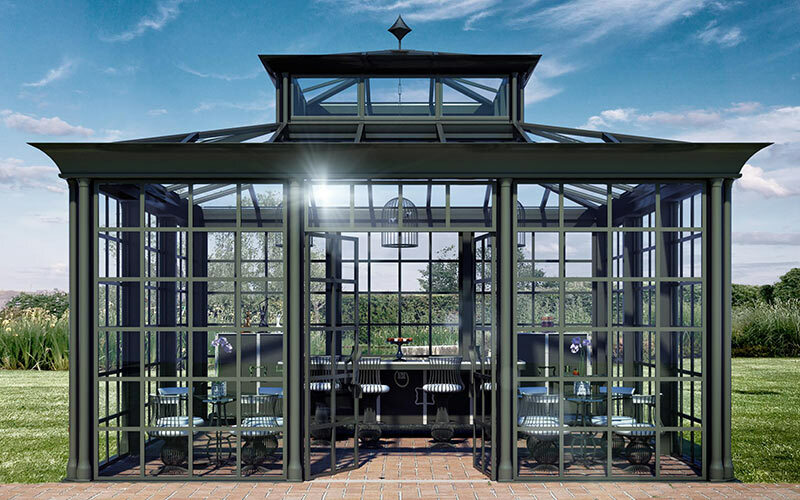 For a few years now, the Italian company DFN has gathered and made use of the experiences of a group of professionals and businesspeople who are experts in the construction and furnishing sector, distributing luxury outdoor furniture collections and outdoor covered areas such as gazebos, verandas and conservatories. Using high quality materials and refined techniques, the brand creates furnishing projects that can ensure the utmost comfort and resist weather elements. DFN works to make even the most unusual outdoor space practical, without forgetting a refined, clear-cut aesthetic taste. For the new edition of Salone del Mobile, the brand has decided to use a more contemporary but still glamorous language. The new Samuele Mazza Outdoor Collection by DFN that will be presented at the Salone has two main codes: Elegance and Materials. Its unique style and obsessive attention to detail and “haute-couture” production, that has been characteristic of the brand’s success to date will remain the same. The new Samuele Mazza furniture range offers luxury outdoor solutions that have perfect lines and proportions, symmetry and balance and the search for new materials and finishes used to express the craftsman’s skill and devotion in every detail. In addition to the wide range of products in the various collection, DFN also offers its customers unique, original designs and models, custom-made furniture that is created to answer the style or space requirements of a specific project. The company’s philosophy to provide exclusive, custom-made products means that every furnishing solution can be customised to the customer’s requirements. Customisation can concern the finish, measurements, shapes or all the above together, and is aimed at obtaining a product that reflects at total expression of the customer’s style. Thanks to continuous research and development of materials that DFN conducts, and the design service aimed at following the customer through every stage of the project, the company can offer solutions that are always different. The kitchen has always been a space for relationships and everyone has their own idea of how this room should be. DFN can satisfy this prerogative in outdoor environments too, using a dedicated design service: the work carried out together with the customer provides endless, exclusive proposals that reflect design needs of kitchen areas created for outdoor spaces. DFN's exclusive, customised service guarantees the realization of any type of customised, outdoor project, from the design of individual pieces to the study of entire outdoor kitchens with every detail. For DFN, creating a customised project means that it becomes an expression of each customer’s unique style. The new Samuele Mazza kitchen collection made and distributed by DFN follows the new style standards for furniture by the designer, creating kitchens with unusual finishes. In this way, shapes, materials, finishes and textiles are combined to create exclusive, luxury environments that are coordinated in every little detail. This year’s outdoor kitchen by Samuele Mazza will be a “masterwork” kitchen in both its technology and design: the finishes chosen are gold and metallic, creating a kitchen that totally renews the idea of cooking outdoors. The majestic nature of marble and the boldness of steel used on counters and domestic appliances respectively ensure aesthetics and weatherproof elements at the same time. In developing its Samuele Mazza range, DFN has decided to focus everything on a product with high technical content, that is still connected with the characteristic language of the brand that designs the collection. La Casa dei Limoni has redesigned conservatories in a totally new way: the customer is greeted with a play of colours, styles, lines, decorations, shadow and light, that make up these classy iron and glass works. La Casa dei Limoni is the brand that echoes the tradition of the lush Italian botanical garden, with additional design and technology that are used to create real outdoor rooms that are just as luxurious, prestigious and comfortable in winter as they are in summer. DFN’s marked aptitude and ability to offer unique solutions with a high level of personality mean that customisation services are added to the new items in the collection, for an entirely customised structure. The Salone del Mobile becomes the ideal stage to present one of the collection’s models. On entering our conservatories, guests will be immersed in a multi-sensory experience, which aims to create emotions and provide an unforgettable sensation from a DFN outdoor project. To underline its ability to created complex projects linked to the outdoor world, DFN comes to Salone del Mobile as the leader of a work team that can follow connected outdoor projects at 360 degrees. DFN has always worked with luxury in outdoor environments and this is why its skills spread over so many levels: if customers come to us it is because they know how to count on a unique proposal, that does not exist elsewhere on the market. We offer made-to-measure solutions: special settings, environments that interpret our customers’ dreams and aspirations and that are unique in their kind, created specifically for them. This is the concept of luxury that makes DFN an increasingly appreciated brand around the world. Our work interfaces with architects’ work and over the years has increasingly concerned both the mobile parts of outdoor areas and fixed ones, such as gardens, paving, coverings and swimming pools etc. DFN is a company that proposes an outdoor lifestyle. Our expertise allows us to work on projects right from the start, and to sometimes intervene even on the concept of a home’s outdoor area. We have a staff of designers who can address external architecture issues at all levels: from distribution of spaces to the definition of the landscape and roofed or covered areas. Craftsmanship, together with the range of products, is a value that we have always concentrated on. After furniture in 2016, we then made our début in the world of kitchens, and then in conservatories. The collaborations that we have established allow us to expand our skills, and have a truly global range, becoming a reference for luxury outdoor projects.